One chooses to furnish one’s home with antique Persian rugs for several reasons. The woven carpets serve as durable, long-lasting floor coverings, adding comfort and warmth to the environment. Most importantly, they are handcrafted works of art, which provide unmatched beauty and grace. As with any art form, in order to truly appreciate antique oriental rugs, one must learn how to properly look at them. “Educated viewing” is a valuable aid in choosing the rug that is certain to provide years of enjoyment. In looking at art-level antique Persian rugs, one should always strive to initially view them in the light of appreciation rather than of criticism. Each rug is unique, the product of highly-skilled craftsmen who developed their physical dexterity and sense of artistic balance over a number of years. An almost incomprehensible amount of creative effort goes into the making of each hand-woven rug. A finely-woven room-size carpet may take a group of weavers over a year to complete. Some oversize and palace-size Persian carpets are the result of three or more years of effort by a team of up to 10 weavers. When looking at an antique rug, as when viewing a landscape, position yourself so that you can see the entire piece at a single glance. Notice what it is about the piece that catches your attention first. Do you relate easily to its overall design and combination of colors? Be sure to view a 19th century rug from two or more vantage points. As the rug absorbs or reflects light differently from each new angle, you will be surprised to notice that the colors take on strikingly varied hues and the design has a somewhat new appearance. After getting a general impression of the rug, examine its design elements more closely. 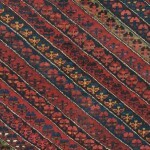 Most Persian and Tribal rugs are composed of a series of borders which serve to “frame” a central field. In the East, it is said that a rug’s borders provide a window to the mysteries of the universe and that what we view in the field actually extends infinitely in each direction. 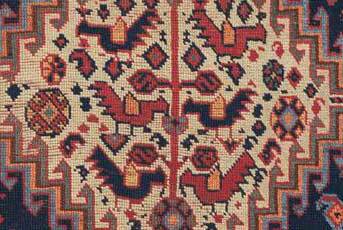 Take note of the hand-woven rug’s main border and its narrower supporting or secondary borders. Each border may be totally distinctive in terms of design, yet the weaver’s aim is to include certain elements which are common in all of them, lending a unified, balanced appearance. Focus now on the field of the antique rug. Does it have the strong focal point of one or more predominant medallions or is it covered with a repetitive overall design? The magic of the master weaver’s art lies in the ability to create unity, in the hand-woven rug as a whole as well as in the relationship between individual details. Each motif should both stand alone and relate to the composition as a whole. Step forward to focus on the individual patterns. Perhaps you see a tiny animal, the delicately drawn details in a series of flowers or triangular forms resembling mountains. Look at each detail in relation to the larger pattern of which it is a part. Examine how the larger design complements both the section of the 19th-century rug to which it belongs and the piece as a whole. You can see that even a tiny cross in one corner of the field is harmonious in terms of shape, size and location with the entire antique rug. As well as being a visual delight, getting to know an oriental rug is a tactile experience. Be sure to touch the rug and experience the quality of the wool. Wool can differ dramatically in terms of durability and resiliency depending upon the conditions under which the sheep were raised and from what part of the animal it was taken. 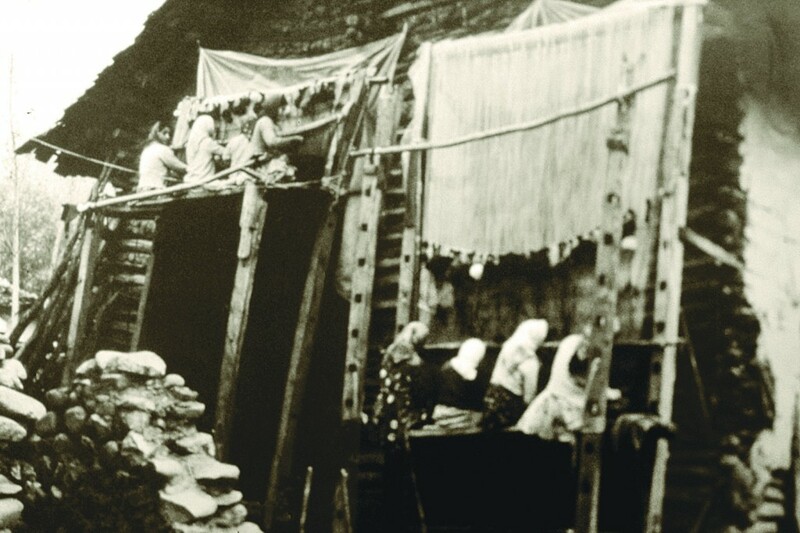 One of the highest quality fibers is “mountain oily wool”, shorn from sheep raised at high elevations in regions of Persia such as Kurdistan and the Zagros range. Mountain sheep are vital and healthy, as they graze the rocky slopes in cool mountain temperatures. Their wool is renowned for its strength and high lanolin content. Finally, view at least one corner of the oriental rug from the back. Look closely at the structure of the woven rug, consisting of rows of tiny knots woven onto a framework of vertical and horizontal foundation threads. 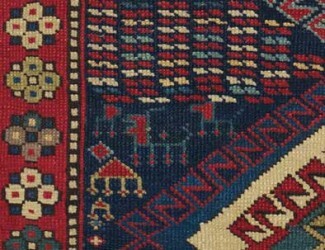 Notice that the design of a hand-made pile rug shows on the back as well as on the front. This is the definitive way of verifying that a rug is hand-made, as machine-manufactured rugs show the design little or not at all from the back. Rug experts can tell a tremendous amount from examining the back of a carpet. 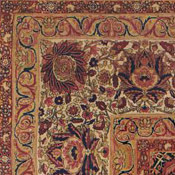 Information such as size of knots, color of the horizontal weft threads, and whether the surface is flat or ridged can be clues to the exact region in which a Persian rug was made. Look at oriental rugs as genuine works of art, which as you become familiar with them, will reveal endless surprises and delight. Overall, you will find that the closer you look at a fine carpet, the more your mind will become captivated and your spirits inspired.